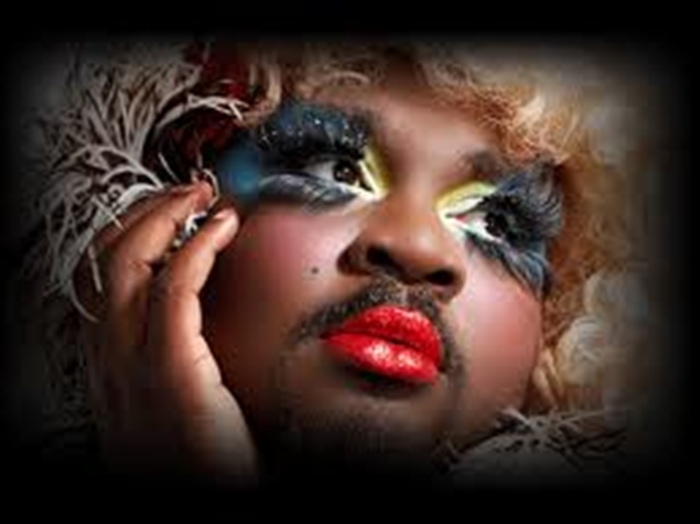 Le Gateau Chocolat: "The Disenfranchised Need A Voice, Society Needs A Mirror, Governments Need To Be Held Accountable"
To call Le Gateau Chocolat a unique individual may be the understatement of the century. The larger-than-life alt-drag bass singer who turned down a career in law has trotted the globe with the Olivier Award-winning La Soiree, raised the roof with barnstorming Spiegeltent shows, movingly revealed the intimate details of his life in BLACK and paid tribute to his favourite stars in new show ICONS. He’s also shown he can play well with others. His A Night at the Musicals with East End drag legend Jonny Woo debuted at the Adelaide Festival earlier this year but has been seen before and after around London at venues as diverse as thriving gay pub The Glory and upmarket pizza parlour basement The Pheasantry. This year has also seen him step onto the National Theatre stage in the latest version of Kurt Weill and Berthold Brecht’s The Threepenny Opera. Next week will see him in a very different environment, that of Latitude Festival (14-17 July). He will be appearing there as part of Soho Theatre’s contribution to the cabaret tent which also features dysfunctional magicians Peter & Bambi Heaven, alt-dragster Christeene, singer Bridget Everett and comedian Sam Campbell. We spoke to him as he prepares to entertain Latitude’s wellied masses. You have had your fingers quite a few pies over the last year, not least ICONS, A Night At The Musicals, La Soiree, The Threepenny Opera and, this summer, your appearance at the Latitude Festival. Apart from filthy lucre, what draws you to a particular project or show? Sometimes it was the opportunity to work with another artist. With A Night At The Musicals it was Jonny Woo and with ICONS, it was Marty Hailey, musical director extraordinaire. It’s also important for me to explore new platform and new stages. At the National, I had the opportunity to grow as an artist and extend my audience reach while BLACK gave me the chance to work with the orchestra Psappha Ensemble. There are so many considerations to be made when making decisions. For instance, there was a spring tour booked for BLACK; Dundee, Manchester, Adelaide but the opportunity to play on the the National stage, in the much respected Threepenny Opera with (National Theatre Artistic Director) Rufus Norris at the helm was too good to miss. Thankfully the presenters from all the respective venues and festivals agreed and were conscientious enough to release and reschedule the project. A festival tent is not your usual theatrical space. How do you modify your performance to that kind of environment? Firstly, by not making a fringe or tent show but by always committing to make the best show you can at the point of its inception. Yes, some of my repertoire is better suited to black box or theatrical environments but my first show, for instance, played both the Bosco tent at Brighton Fringe and the theatre at Menier Chocolate Factory. It’s incumbent on the performer to assemble the ingredients necessary to help people forget, dream, imagine, feel, be entertained from lights to dramaturgical considerations – all these story telling tools must never be undermined. Also, I think there is currency to be had in relishing the juxtaposition of high art in low places or vice versa. Doing the running man with Sharlene from Basement Jaxx looking like a loofah sponge on the Barbican stage was simply heaven. When not on stage, will you be gadding about the festival or will this just be a flying visit? I think it might be a flying visit though Jonny Woo has just asked if I might be interested in a singing with the Glory presentation. I think Richard Thomas (Jerry Springer: The Opera) might be on piano and I love him. He’s hilarious. Kurt Weill, who provided the music to The Threepenny Opera, was encouraged by his parents and tutors to go down a more elitist and traditional career path yet he felt that music should be something enjoyed by all. Should classically-trained artists be encouraged to go beyond their comfort zone and reach out to the public? After not taking up a place at Guildhall and being subsequently rejected by the Royal Academy, not thinking laterally was imperative. The operatic stages are seldom peopled by minorities and as I much as I love the art form, it does nothing to encourage or inspire me to pursue it, for it becomes an exhausting enterprise but that’s a much longer conversation. Imagine the time when I could’ve taken my niece, in the Seventies at the Met, to see Leontyne Price sing Cio-Cio San in Madame Butterfly? Incredible. In that vein, rather wonderful to read of Sheku Kanneh-Mason’s Young Musician of the Year win. Going beyond one’s comfort zone breeds an exponential growth and learning that can’t be taught. What is the role, then, for the government or the academies in realising an artist’s potential? Whether there’s a “happy ever after” is often down to all three of the government, the academies and most importantly, the artist. Not everyone who train is going to be working at the opera house or ENO or Opera North etc but it doesn’t mean one is a failure. There are so many avenues to explore. And I think seeds of industriousness should be planted by academies to encourage to dream big but with tenaciousness and variety. I think the government have an important role to play but that’s a much bigger conversation and certain not with jokes like Nicky Morgan as the minister for education downgrading the important of arts in our society in praise of STEM subjects. The classical arts are still very much perceived as something done by and for the white middle classes, chiefly in London. Would you say that was an accurate description? Do you see this ever changing? It very much is. I have only ever experienced a truly diverse audience at the Unity Theatre, Liverpool. A little at the Albany but everywhere else, it’s been mostly as you describe: white middle class. Even at Edinburgh Fringe. That said, being in the audiences of both Amen Corner at the National and In the Heights was really thrilling as they were very mixed. I will say, it has been extraordinary rehearsing at the National at the moment; The Flick, The Suicide, Le Blanc, Ma Rainey’s Black Bottom– all playing. There’s a comfort, an encouraging comfort that comes from that level of diversity. And hopefully, the programming reaches out to different communities and showcases the very concept that theatre and art is for everybody. “Art should comfort the disturbed and disturb the comfortable” said Banksy. Never a truer word said. The disenfranchised need a voice, society needs a mirror, governments need to be held accountable. Voices are found, developed and amplified with the support of public arts funding. The importance of which should never be undermined or over estimated. We live in a world where Idris Elba is “too street” to play Bond. A black Hermione despite approval from the author J.K. Rowling, breeds such outrage. Again, I think there’s a much bigger conversation here. I take the responsibility of this platform very seriously, we could talk about this for hours but whilst the conversation needs to be had, one must continue to seek different avenues and platforms to show work. Do you think the shrinking purse of public arts funding will encourage or restrict artists from alternative backgrounds breaking through? BLACK was created with such funds. Duckie, who I working with, was unfortunately unsuccessful in its bid but was thankfully still workshopped with the kind support of Colchester Arts Centre, the Wolsey Theatre and Norwich Arts Centre. Restricting this funding or constant cuts to it will mean whole communities might not be heard and the privileged remain de riguer. Where can people see you after Latitude Festival? I’m at The Threepenny Opera at the National till September, ICONS in soho theatre at some point this year, Duckie, a new family show being discussed as a Christmas run at the Southbank, BLACK will be at the Dublin Theatre Festival followed by an autumn tour somewhere in London. Failing all of that, there for the travelling amongst you (should this materialise, I might actually die) Wagner’s Tannhauser in, wait for it, Bayreuth! Latitude Festival takes place this year from Thursday 14-Sunday 17 July.